While he was a young man in the Netherlands, Vincent van Gogh worked for a gallery and seemed headed toward a career as an art dealer. A few years later, however, while working at the London branch of the dealership, an unrequited love turned his thoughts inward. He was a deeply spiritual person and his interest shifted toward becoming a minister, as was his father, in the Dutch Reform Church. Upon returning to the Netherlands, he tried to enroll in divinity school but was turned down. Vincent was turned down again when he wanted to be a missionary so he made the decision to take the Gospel to the coal miners in Belgium on his own. Miners there lived in great poverty and without hope but Vincent learned that nothing he could say or do would make a difference. As a result of his failures, he reasoned that painting might be a way he could give expression to his inner spirit without having to interact directly with people. He went about methodically to master the discipline of art and after three years of drawing and painting, he moved to Paris to be with his brother, Theo. In Paris he became familiar with impressionism and started using bright colors but unstable conditions led him to seek a change of environment in the south of France. There, in Arles, he became immersed in his subjects as he painted the surrounding wheat fields and the orchards in bloom. He said “I feel like nature has spoken to me.” The artist, Paul Gauguin, joined him but soon their personalities clashed and after an argument, van Gogh went back to his apartment and in a state of intense frustration, severed the tip of his ear. City officials thought they had a madman in their midst and placed him in jail. 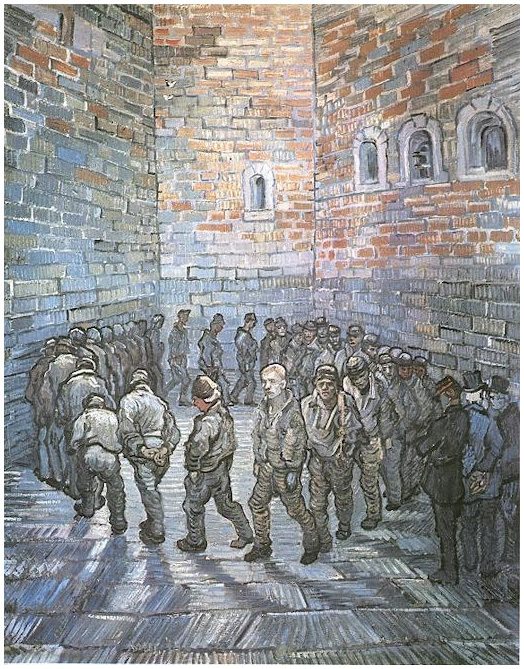 His brother Theo arrived and Vincent volunteered to stay at an asylum in Saint-Remy until he felt better. It was agreed that while recovering he could go out into the surrounding countryside to paint when he felt like doing so. His masterpiece, “Starry Night” was painted during this period. At times when he became depressed, he stayed indoors and turned to his books. In them were paintings by artists he admired; he identified with aspects of some of their paintings and began to make copies. The reproductions, however, were not in color and, not having seen the originals, he painted them with colors of his own choice. He regarded this as being similar to a performer interpreting a musical score. Among the paintings he interpreted were Rembrandt’s “Raising of Lazarus,” and Delacroix’s “The Good Samaritan.” It is likely that his own confinement attracted him to Gustave Doré’s “Prisoners Exercising.” Because of his affliction it is likely also that he felt like a prisoner within himself.